With Concordia’s 2016 baseball season in the books, it’s time for one last look at a year that saw the Stingers come within one win of making the national finals. Given baseball’s reputation as the “moneyball” sport, what would be more appropriate than a statistical retrospective? The Stingers played 24 games this season in the Canadian Collegiate Baseball Association (CCBA), finishing second out of five teams in the Northern Division. 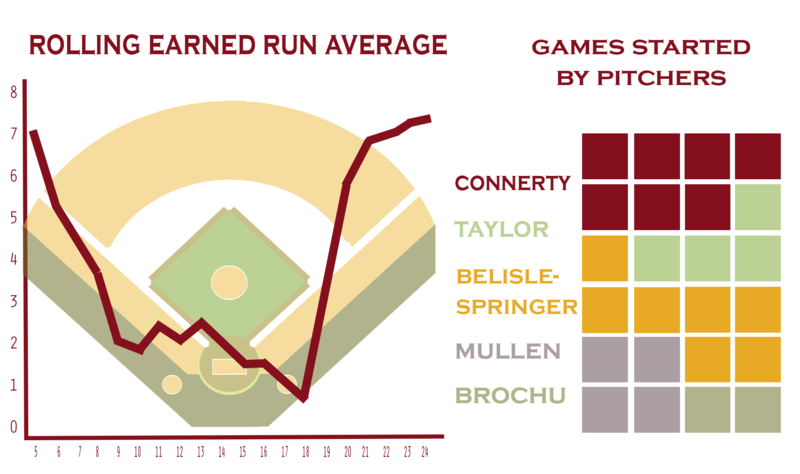 The Stingers were not an amazing power hitting team this year—they had only one home run in 2016. Their rivals from McGill, who finished first in the Northern division, had them beat in power at the plate. Where the Stingers made up ground was by playing “small ball”: getting on base a lot and stealing bases. Second baseman Roberto Zapata led the team in this regard, stealing almost one base per game. To the right are the team’s on-base plus slugging (OPS) leaders. OPS is a general purpose statistic to measure how successful batters are at the plate—such as how often they reach the base. Concordia’s pitchers Sam Belisle-Springer and Dan Connerty had a slow start to the season, hampered by offseason rust and the pressures of becoming team leaders, as they said in last week’s article in The Concordian, titled “Saying farewell to Concordia’s pitching duo.” They bounced back by mid-October, but were unable to carry that success into the postseason. The graph below shows the team’s earned run average (ERA) as the season progressed. ERA is the average number of runs a pitcher himself allows over seven innings. While Belisle-Springer and Connerty are leaving the team after this season, pitchers Jarryd Taylor, Sam Brochu and Shane Mullen will likely start a lot more games next year.